I finished the construction of the frame that holds the dynamo case to the front of the engine. My buddy Mark was kind enough to do the welding. 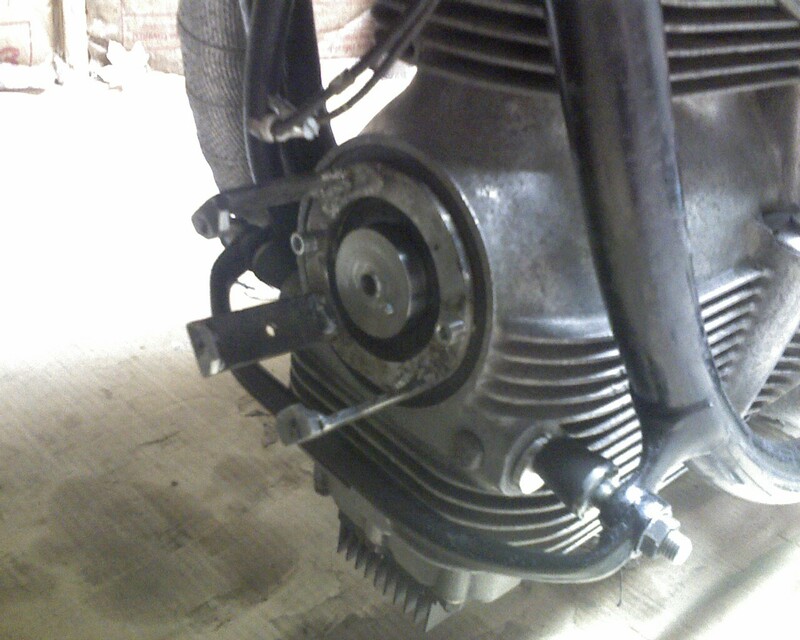 A few minor adjustments and some precision holes drilled and I was ready to fully assemble the alternator to the bike. First the cage must be installed with one arm out. 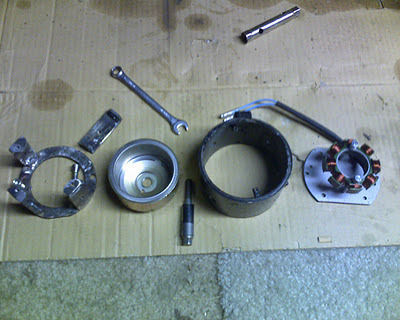 Then the magnet cup can be installed and the center bolt attached to the crankshaft and torqued down. The fourth arm is then installed. The casing can be placed over the cage and the screws installed where the pole shoes used to be. The critical alignment of the stator inside the magnet cup was done with extreme care and precise drilling. 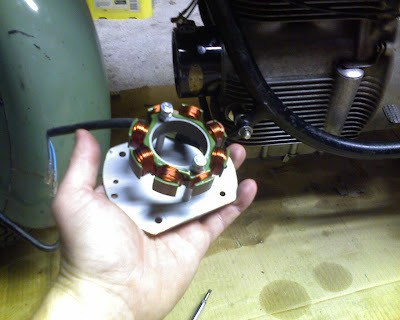 The stator will have some larger screws holding it to the plate in the final assembly, and a spacer to make sure it stays parallel to the plate. Everything gets tightened. In the final assembly the wires would go to the stock terminal block, but for this test without the regulator, I'm just going to hook some jumper leads out through the front. Old KYL95 started on the first kick and we had LIGHT!!!!! The automobile headlamp provided some visual load. The voltage was around 6 at tickover. It increased to 12 if I revved it up a little. The regulator/rectifier will be installed in the electrical box, after the cage is sandblasted and painted. With the Rectifer/Regulator fitted, and the stator properly centered, the alternator is ready for a shakedown run. I had to re-design the holder for the stator. 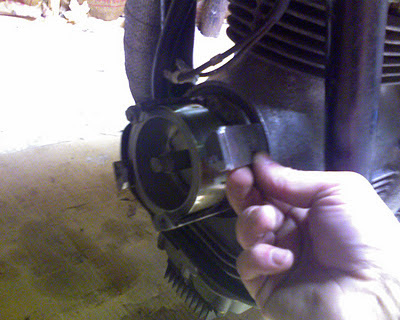 The stator is now centered by the original ball bearing assembly from the Kubota backplate. The clearance was too tight to do it without a proper reference point to the magnet. 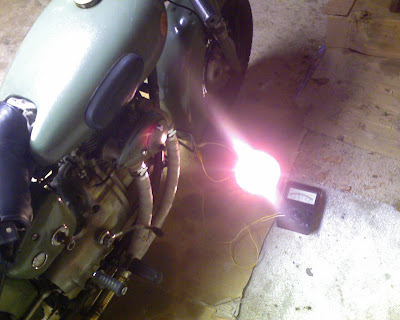 It works well running in the workshop. Charging is developed just off idle.